The Solar and Heliospheric Observatory captured this shot of a huge coronal mass ejection on Oct. 1, 2011, shortly after a comet dove into the sun (inset, right). 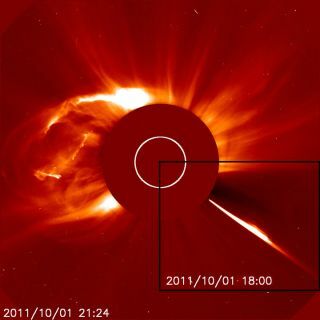 A huge solar eruption that occurred right after a comet plunged into the sun was likely a coincidence, experts say. The so-called "sungrazing" comet streaked toward the sun Saturday (Oct. 1) and disintegrated after getting too close. The sun then unleashed a massive eruption of solar plasma known as a coronal mass ejection, which can rocket through space at 3 million mph (5 million kph). But there's no reason to think the two dramatic events were related, scientists said. Solar astronomers with the sun-watching Solar and Heliospheric Observatory agreed. "The question of whether a sungrazing comet can somehow trigger a coronal mass ejection is an intriguing one," SOHO scientists wrote in a website update this week. "So far, the feeling is that [the] apparent relationship between some comets and some mass ejections is simply one of coincidence." CMEs and other solar storms are magnetically driven, erupting after magnetic field lines on the sun twist, break and reconnect. Scientists don't know how a comet could spur such a process, wrote Battams, who does computer processing for SOHO and runs the sun observatory's comet-sighting website for the Naval Research Lab. The likelihood seems more remote when you consider that death-diving comets rarely actually reach the sun's surface. Instead, they generally break up after veering too close. And sungrazing comets tend to be small. The comets spotted by SOHO have cores about 330 feet (100 meters) wide at most, according to Battams. The sun, on the other hand, is about 865,000 miles (1.39 million kilometers) across. "I'm lucky enough to be surrounded by some of the best solar physicists in the world, and none of them can think of a reasonable mechanism in which physics would allow this event to be initiated by any comet, let alone such a tiny one," Battams wrote. Researchers also have a pretty good idea of where Saturday's CME originated, he added, and it looks like the death-diving comet didn’t come anywhere close to that spot. Finally, Battams has gone through the SOHO data and found many sundiving comets whose death plunge was not followed by a CME. But the times when the two dramatic events occur one after the other tend to stick out in people's minds, he added. When the sun is active, it can unleash a dozen or so CMEs per day, and perhaps even more, Battams wrote. And sungrazing comets aren't all that rare, either. During a 10-day stretch in December 2010, for example, at least 25 comets hurled themselves into the sun. So it would be surprising if at least some CMEs didn't occur shortly after a comet plunge, just by chance alone. And that could start happening more and more, because the sun is in an active phase right now, researchers said. "At this stage of the solar cycle, the sun is producing many mass ejections — in fact there were several earlier in the day [Saturday] — and it probably just happened by chance that one of them was around the same time as the approach of the comet," researchers with SOHO, which is a joint effort of NASA and the European Space Agency, wrote in an update Monday (Oct. 3). "Some researchers have been looking for a more direct relationship, but nothing as yet has come out of these efforts," they added. Activity in the current cycle, known as Solar Cycle 24, should peak around 2013, experts say.